Kashmir is known internationally for its style of embroidery which is found on garments like the phiran, tapestry, curtains, shawls and household linen. The craftsmen draw inspiration from the landscape and the embroidery is renowned for its beauty and richness. The main patterns in this region are chinar leaves, cypress cones, the lotus and almonds. Kashida, the local lingo for the embroidery, in a number of stitch styles, of which, the sujni stitch is used when uniformity is desired on both sides, like in choice shawls. Zalakdosi, the chain stitch done with a hook is found on chogas (cloaks) and rugs with long and flowing designs. A buttonhole stitch for thick fillings is Vata-chikan. Amli embroidery in multicoloured threads is found in Kani shawls while Do-rookha is a double-sided stitch used to create similar patterns on either side but with different colour combination. 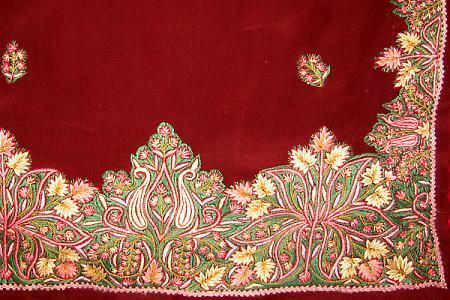 Gold or silver embroidery is done around the necks of the gown or phirans while chain and cross-filling stitches are used to do crewel work on namda or carpets. Gabba is another type of floor covering made out of old blankets with a combination of applique work and chain stitches. Patterns on gabbas and namdhas are in floral and geometrical designs. Shawls and furnishing fabrics are also embroidered while the famous Pashmina shawls are embroidered with fine silk thread .